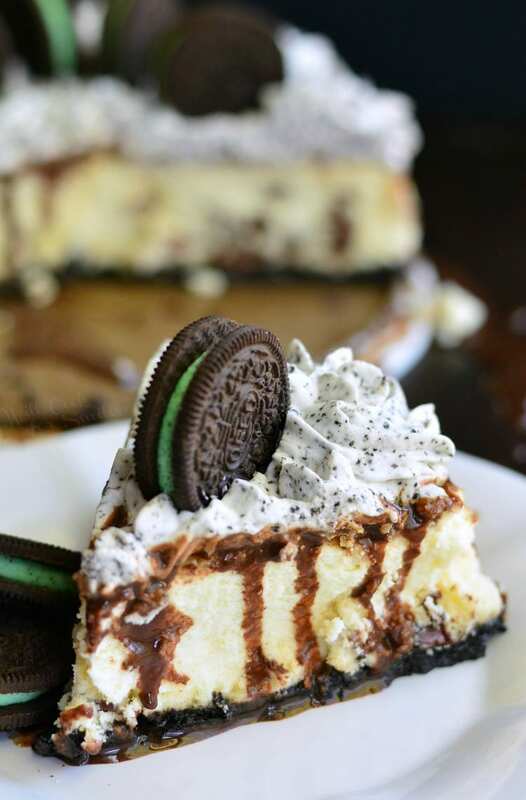 Unbelievably delicious, smooth, and creamy Oreo Mint Chocolate Chip Cheesecake. 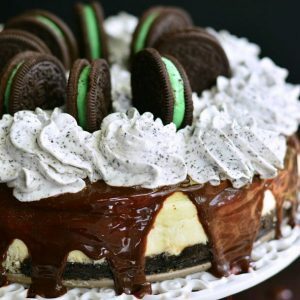 This tasty cheesecake is made with mint Oreo crust, filled with mint chocolate chip cheesecake, topped with hot fudge topping and mint Oreo whipped cream. 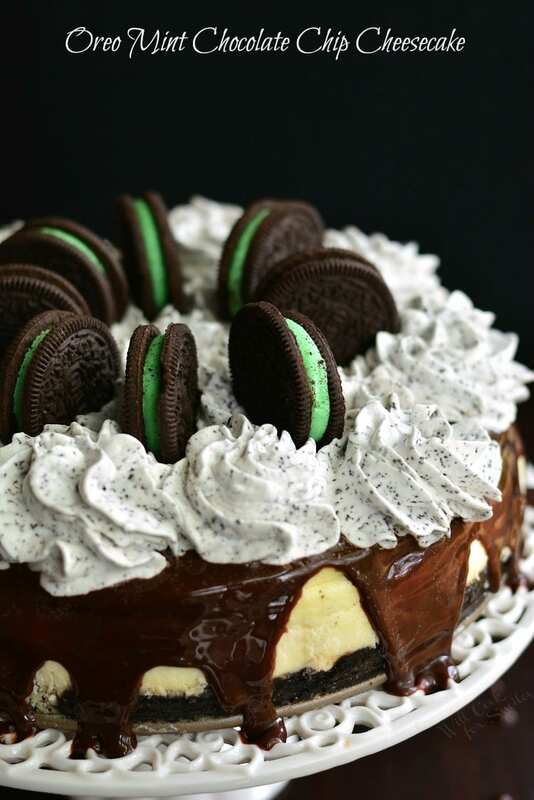 Delightful combination on mint Oreo cookies and mint chocolate chip cheesecake. 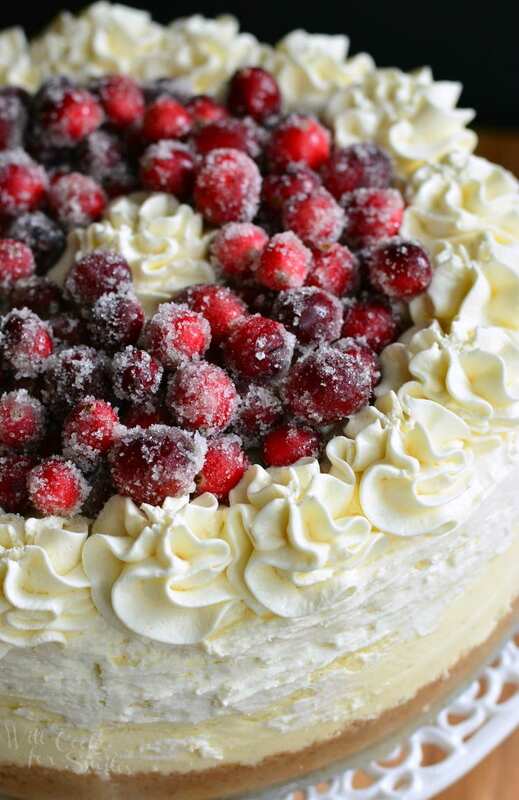 We loved this cheesecake so much, I made it twice in one week. Yes, it was mostly because we liked it so much but also because my stupid memory card decided to erase the photos of this cheesecake before I had a chance to get them onto my computer and write the recipe. It’s not the first time that my memory card went on strike but it was the first time where I could not recover the photos, not even with the program that I paid a lot of money for. There were some tears involved but I rallied, and made the cheesecake again because it is TOO good not to share. My husband tried so hard to be comforting about me loosing photos but he could not hide the smile when he said, “you know, you can make the cheesecake again!” I guess it’s hard to hide the fact that you are drooling at the thought of a delicious cheesecake. I don’t blame him, it was very tasty! Pulse cookies in the blender until it becomes just crumbs. In a small bowl, combine cookie crumbs and melted butter until evenly incorporated. Press cookie crust mixture into the pan, evenly, all over the bottom and a little bit up the side. Add mint extract, and sour cream. Mix until combined. Lower speed and add corn starch. While on medium low speed, pour in heavy cream. Mix until all combined, scrape the sides and bottom of the bowl and mix again until smooth. Pour the cheesecake batter into the spring form with prepared crust. Place roasting pan into the oven and place the cheesecake springform pan inside the roasting pan. Carefully add water to the roasting pan, about half way up the side of the springform. 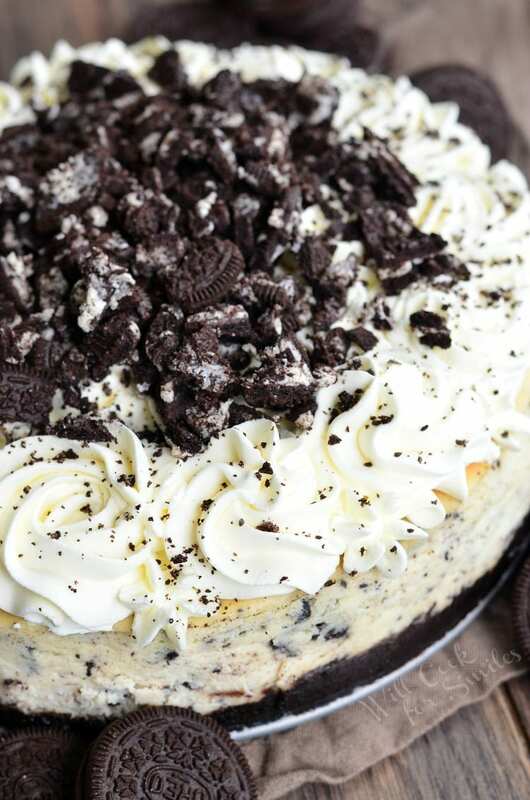 Cool cheesecake for about an hour and then place it in the refrigerator. Refrigerate for at least 4 hours before adding the topping. Pulse mint Oreo cookies in the blender until it's just crumbs. Set aside. Add cold heavy whipping cream into the cold mixing bowl. 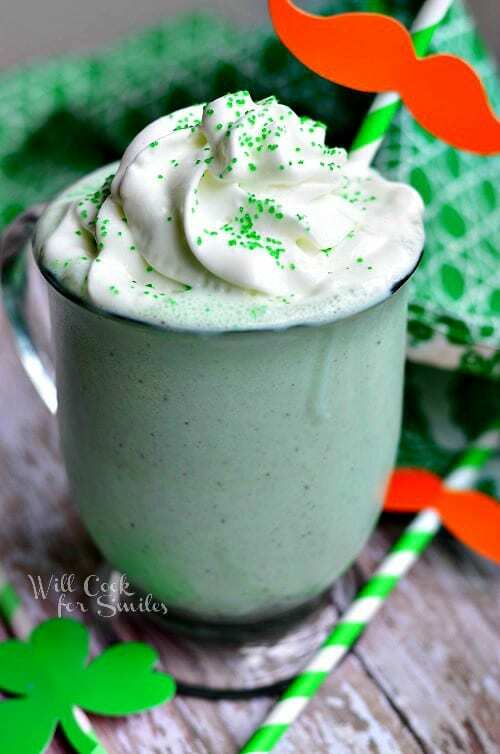 (Use whisk attachment on the electric mixer.) Starting at low speed, start beating and gradually raise speed to high. Slowly pour in sugar. Beat until stiff peaks appear (don't walk away far). Carefully fold in mint Oreo cookie crumbs. Keep whipped cream in the refrigerator until ready to use. You may need to warm up hot fudge topping a little bit if it's too solid to pour over the cheesecake. 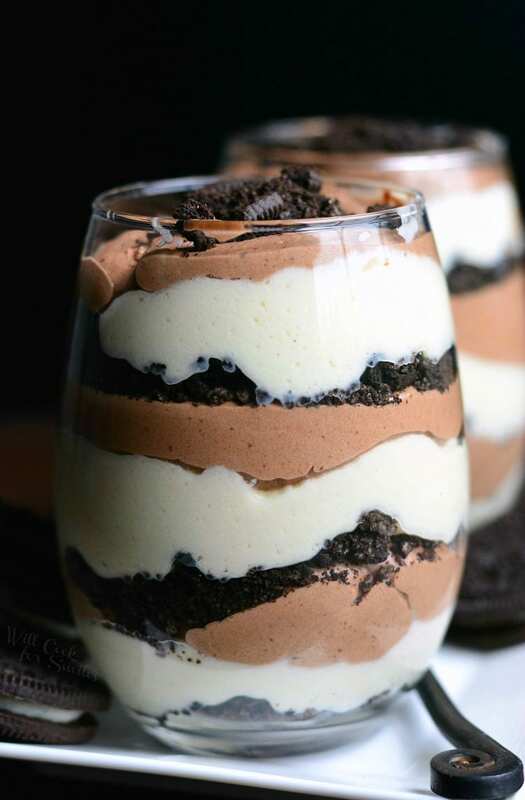 Pour hot fudge topping over cold cheesecake and spread it all over the top. Let it cool before adding whipped cream topping or it will melt. 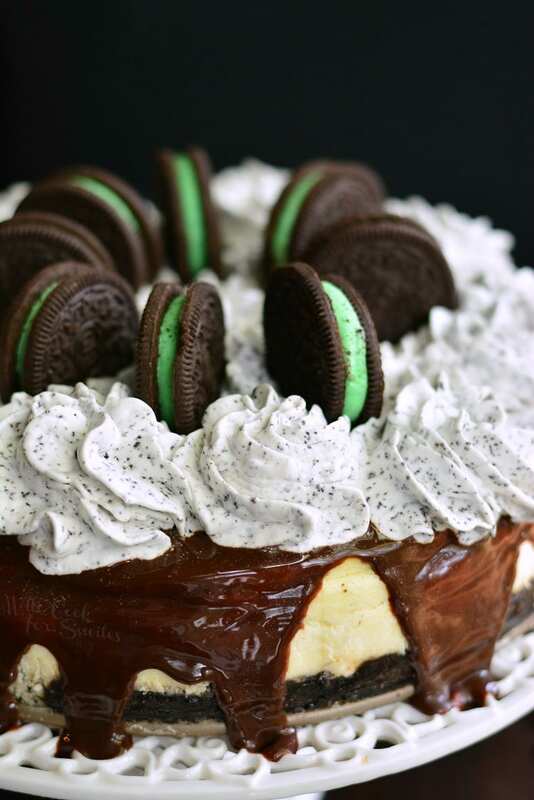 Place mint Oreo whipped cream into a piping bag fitted with a frosting tip (I use 1M) and frost the cheesecake as you wish. 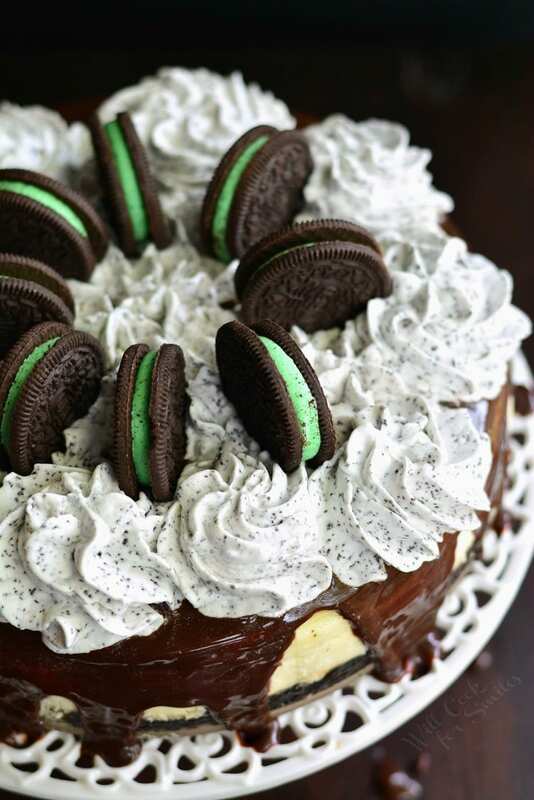 You can also decorate the cheesecake with some whole mint Oreo cookies. This is a fabulously yummy cake! !